I just added this link to my Blogroll. I had been curious about a lean-to on the park map and decided to go check it out. 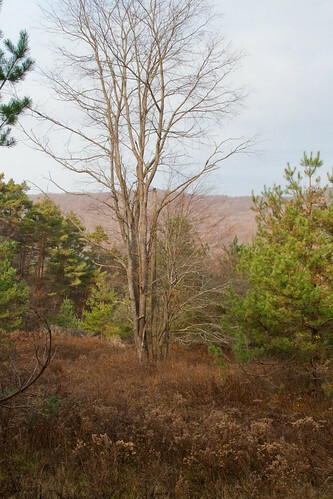 It is reportedly on a section of the cross country ski trails – along the Ridge Run. 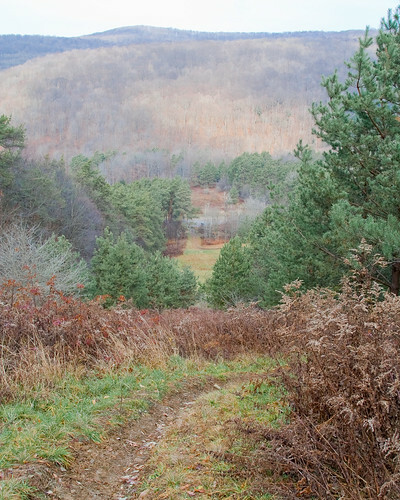 We parked at the Bova Creek area – where once upon a time there was downhill skiing – and headed up Patterson Run. 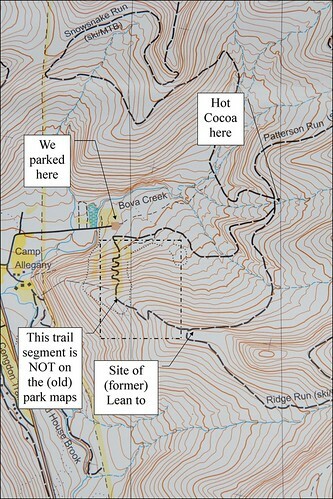 We had a cup of hot chocolate at the point where Patterson, Ridge Run, and Snowsnake Run all meet up, then took the sharp right turn to follow Ridge Run. At the site of the supposed lean-to, there were a few pieces and parts that could have been part of a structure once, I suppose. Why I didn’t take a picture, I’m not sure. This is a picture of the truck. Can you see it? Patterson and Ridge Run are wide and recently groomed and grated in preparation for snow and the cross country ski season. 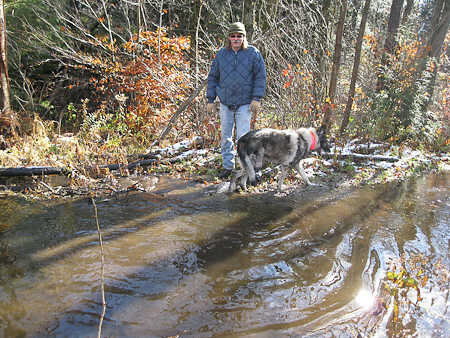 Once that happens, dogs and snowshoes are not allowed on those sections of trail. 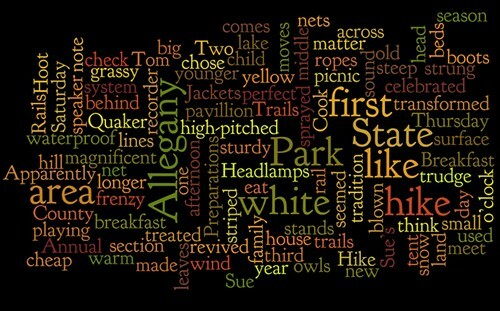 I have heard a rumor that new maps of the park are in the works. I am looking very forward to those! I arrive at dawn and hustle in to my office. 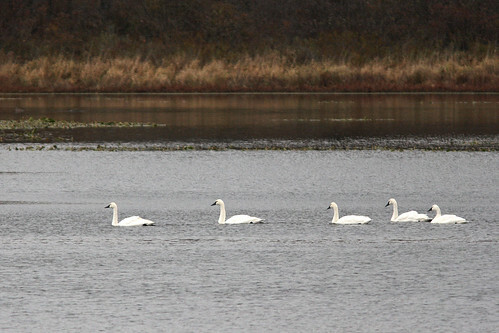 Big white blobs on Big Pond turn into Tundra Swans through my binoculars. I work a while. Then I hear the boss’s voice over the P.A. system: There’s a mockingbird in the sumac next to the stop sign by the entrance. Coats on, grab binoculars… out we go. Our mission is interrupted by a distant, yet loud chorus of geese. We watch the empty skies in anticipation as the honking gets louder. 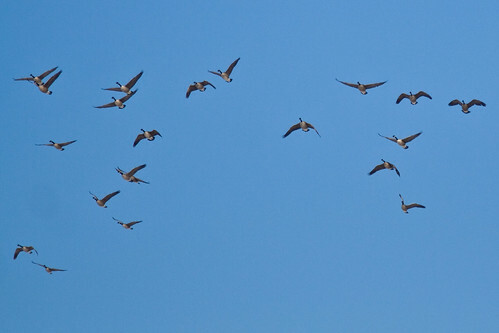 Finally – there… just over the trees – hundreds and hundreds of geese heading out to join the white blobs, I guess. We return to scanning the bushes. 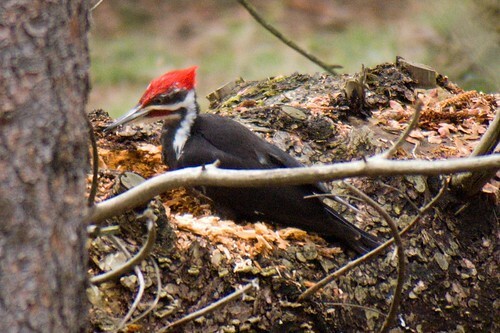 We never see the mockingbird, but we do spot a pileated woodpecker, working a tree, then flying overhead. Where else does your job require you to take occasional bird breaks? No owls at the first net check at 6:30 p.m. We return to the house for chit-chat and a tour. By 7:15 p.m., Patty is home from work with groceries, but not ready to accompany us for the second net check. Tom teases that this is a good thing, because they never get birds when Patty tags along. Back up the hill and this time, I notice the brillance of the stars in the black sky. This time – 2 little puffballs are caught in the nets. Tom deftly removes them and places each in his own separate carrying bag and we head back down the hill. Tom let’s me handle the first bird and I am thrilled. Wing measurements and weight are taken first and compared to a chart. 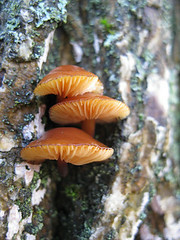 Males are smaller and lighter than females. This one definitely falls in the male range. A leg gauge helps me determine the right size band. Next, a tail measurement, and a check for fat and muscle condition. Finally, we use a blacklight to look at the feathers on the under side of the wing. New feathers appear pink under this special light, older feathers look “normal”. The combination of pink and normal tells us that this is not a hatch year bird; he has more experience than that. And now it’s picture time! The second owl is feistier. When I try to handle him, he grabs on tight with sharp talons. He does not break the skin, but I fear he will leave a bruise. He finally releases his tight grip. Tom offers to band him. Thank you, Tom. This one is a hatch year male. I wonder if he will mellow with age? Or are owls, like people, born with personalities that stay with them for life, merely intensifying with life experiences? The third net check brought us nothing. I decide to head home. The moon is bouncing on the top of the distant hill – a huge orange sliver. 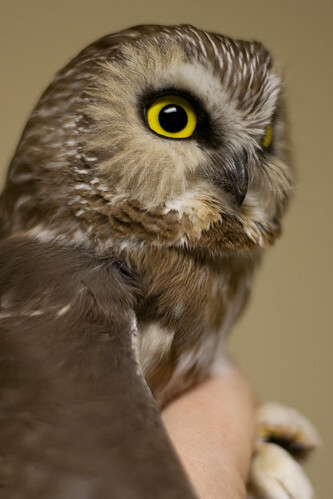 Learn more about the Northern Saw-Whet Owl at the Cornell Lab of Ornithology website –> click here. 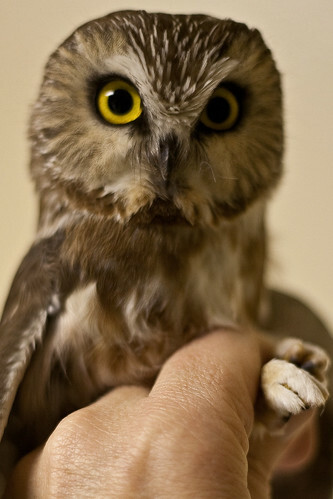 Read more about Tom’s owl studies at his blog –> click here. Saturday treated us to the first snow of the season, and it seemed like a perfect day for a hike on a section of the Chautauqua County Rails to Trails system. The boots I chose were sturdy and warm, but old and no longer waterproof. I didn’t think it would matter. The transformed rail beds are sometimes wet and muddy, but you don’t have to walk through standing water. Usually. As we came into the clearing where the Beaver Pond opens out on the west side of the trail, we scared up a large flock of unidentifiable (to me) ducks, definitely not mallards or wood ducks, as their escape was voiceless. Oh boy. Now how are we going to get around that? I was ready to turn back, go to the house, stack some wood. Terry and the dogs had other ideas. So, I followed their lead, stepping gingerly on the beaver dam, trying not to use the poison ivy-covered trees for support. I made it about three quarters of the way to the other side before I was forced to step into water that soaked through my old boots. If only the beavers could be trained to build their dam on the pond side of the trail. It’s a good thing wool socks are warm even when they are wet. I was able to forget about my wet feet and enjoy the beauty of the day. The air was crystal clear and there was barely the hint of a breeze. 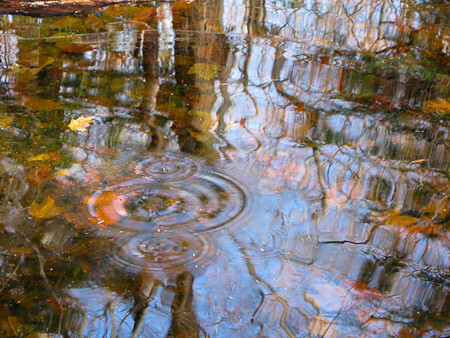 Every watery surface was a mirror. 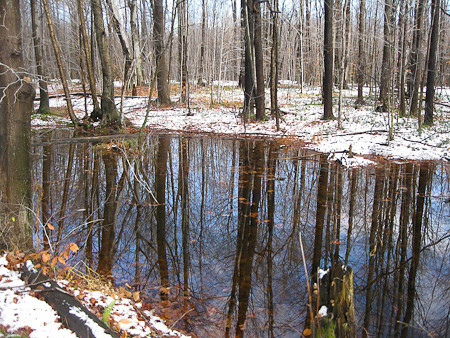 One of the mirrors was being constantly disturbed by melting snow. 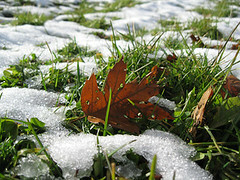 It was mostly a day for grand sweeping landscapes, but little things caught my eye now and again. Had we a map, we might have hiked the full length of this trail; we didn’t realize how close the end of it we were. 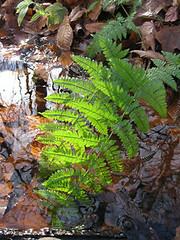 Next time, we might start at the north end and hike south to the flooded trail and back. 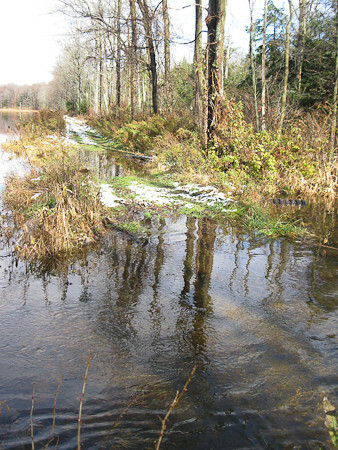 The Portage Trail is a spur off the main Rails to Trails system that starts in Mayville along Route 430 between Mayville’s 4-corners and the Hartfield airstrip. Parking is just to the left of the black and red Range Resources building. Bill Sharp was a naturalist and educator in Chautauqua County. 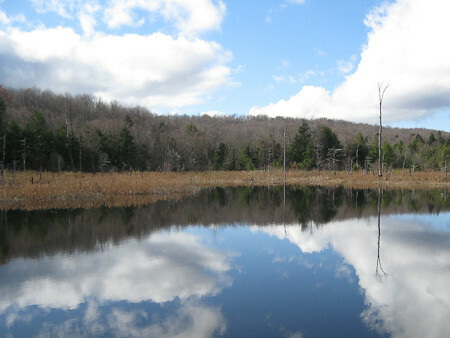 According to an article in the March-April 2007 of Parks and Trails E-News (link below), this segment of trail began as a Native American portage trail between Lake Erie and Chautauqua Lake. 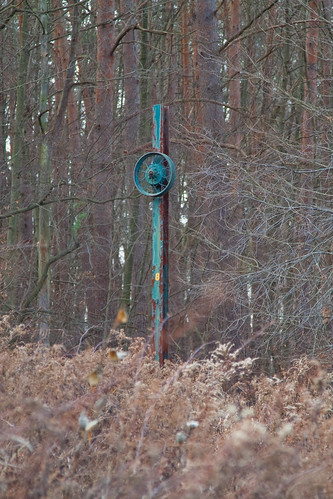 In the early 1900s a steam-powered rail line was developed there. It was converted to an electric powered trolley in 1910. 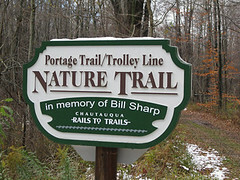 This section was dedicated to the memory of Bill Sharp in September of 2006 by the members of the Chautauqua County Rails to Trails organization. A big yellow and white striped tent stands in the middle of the grassy area. Preparations are being made: leaves are blown, ropes are strung, white lines are sprayed. The wind moves over the surface of the lake, whipping it into a frenzy, then across the land and into my face reducing the feels-like temperature several degrees. I wish I had a more tightly woven hat. Down by the fisherman’s dock, now stacked on shore for winter. Deep piles of empty zebra muscle shells. Fishermen drive their boat dangerously close to the shallows where huge rocks are just barely submerged. They must frequent this spot, for they stop, just in time, and let the waves and the wind take them back out to deeper water as they cast their lines. On the return route, a giant blob in the tree. With eyes that seem to follow our every move. It’s cold and windy and you can almost hear the Great Blue Heron‘s thoughts: “Don’t make me move from this spot.” He seems on the verge of take off. In the end, though, he doesn’t fly. A few steps further, an American Coot trusts us less and swims away from his hiding spot in the brush along the shore. Not for long, though. As soon as we pass, he’s back in the brush.